BreakPoint: You Want Religious Freedom? Canada, our neighbor to the north, is at war… I’m not talking about the trade war. I’m talking about their fight against religious freedom. Last week, the Supreme Court struck a blow against religious freedom. Not our Supreme Court. 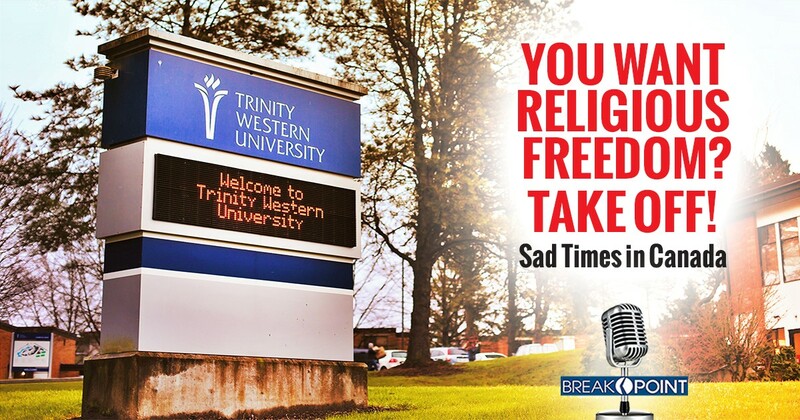 The Canadian Supreme Court decided that law societies can deny accreditation to the proposed law faculty of Trinity Western University. What made the decision really troubling was the Supreme Court, in essence, ruled that religious groups aren’t free to impose their own beliefs on themselves, at least when it comes to LGBT issues. In 2012, Trinity Western decided to create a law school. After the plan was approved by Canada’s equivalent of the American Bar Association, most provincial law societies accredited the program, which allowed Trinity Western’s graduates to practice law in their province. The big exceptions were British Columbia and Ontario, which both ruled that the Covenant discriminated against LGBT people. It didn’t matter that the Covenant applied equally to everyone, or that if an exception were created for LGBT students then heterosexual students could plausibly claim they were being discriminated against on the basis of their sexual orientation. The case reached Canada’s Supreme Court, who, by a 7-2 vote, affirmed the law societies’ actions. The outcome was bad enough, but the “reasoning” was ridiculous. The Court ruled that the law societies had struck a proper balance between religious freedom and the “public interest” in preventing discrimination on the basis of sexual orientation. And further, the court said that attending a Christian law school is a kind of lifestyle choice, not a necessity, for would-be lawyers. You mean, unlike being able to cruise gay bars and hook up with strangers? So, attending a Christian law school is an unnecessary lifestyle choice, but sexual behavior is not? As I said, this is a huge blow to religious freedom in Canada. And there’s no reason to think the so-called “logic” of this ruling will remain limited to just law schools. It’s difficult to imagine a U.S. court being as presumptuous as the Canadian one when it comes to deciding what a “Christian environment” requires. The U. S. Supreme Court has made it clear that the Constitution requires judges to resist such a temptation. But still, the accreditation of Christian schools in the U.S. is increasingly under fire. So it would be foolish to say that something like that can’t happen here. The troubling decision from Canada’s Supreme Court is a concern for Christian education in the United States. Read more about the opinions in the case by clicking on the links in our Resources section.